The intracytosolic niche for replication of Listeria monocytogenes (Lm) facilitates delivery of bacteria-derived Ags into the MHC class I pathway for subsequent stimulation of CD8 effector T cells. Using Lm strains that are equivalent for in vivo virulence yet express marked differences in the level of secretion of a protective target Ag, we have evaluated how these specific differences in secretion levels influences the magnitude and effector function of Ag-specific CD8 T cell responses following Lm injection. Immunization with low doses of a hyperantigen-secreting Lm strain stimulated enhanced target-Ag specific CD8 T cell responses compared with the magnitude stimulated following immunization with the same dose of wild-type Lm. The enhanced determinant-specific response was also evident by in vivo CTL activity, increased numbers of memory cells 4 wk following immunization, and enhanced antilisterial protection following a challenge infection. Initiation of antibiotic treatment 24 h following infection with wild-type Lm markedly reduced the magnitude of the effector CD8 T cell response. In contrast, antibiotic treatment initiated 24 h following immunization with the hyperantigen secreting strain of Lm did not impact the frequency of the target-Ag specific CD8 T cells. Thus, immunization with a low dose of a hyperantigen secreting Lm strain, followed by antibiotic treatment to limit the extent of the infection, may represent a safe strategy for the stimulation of enhanced effector CD8 T cell responses to specific Ag by a rLm vaccine. The extensive understanding of Listeria monocytogenes (Lm)3 pathogenesis, its’ effectiveness at stimulating protective T cell responses, and the ability to engineer delivery of heterologous Ags to infected host cells has led to the focused development of Lm as a vaccine delivery platform. A number of studies conclusively show that immunization with Lm strains engineered to express viral or model tumor Ags leads to stimulation of CD8 effector T cells that mediate protection against lethal viral challenge or challenge with tumors expressing the same model Ag (1, 2, 3). More recently, a number of reports have shown that immunization with rLm strains expressing endogenous self-derived tumor Ags stimulates tumor Ag-specific CD8 effector T cells that can eliminate established tumors, including a murine melanoma model in which MHC class I expression by the tumor is greatly reduced (4, 5, 6, 7). Further, pre-existing antilisterial immunity does not prevent the priming of CD8 T cells to new Ags delivered by rLm strains, strengthening the potential value of Lm as a vaccine vector (5, 8). As Lm can cause significant human disease, the clinical use of this pathogen as a vaccine delivery vector raises a number of safety concerns, with various strategies used to minimize these issues. A recent report described the stimulation of protective CD8 T cell responses with a recombinant strain of Lm that is replication deficient, due to psorolen-mediated DNA crosslinking (6). Although it is clear the psorolen-treated bacteria are unable to replicate, some metabolic pathways still function at a level that allows for Ag secretion and the subsequent stimulation of cellular responses. We recently reported on the use of an avirulent construct of Lm that is unable to replicate within host cells but allows for the directed delivery of the natural array of Lm-derived Ags to the cytosol for processing and presentation of MHC class I associated targets and the stimulation of a protective cellular immune response (9). Although these attenuated, avirulent Lm strains have proven successful at stimulating CD8 T cells, larger vaccination doses are required for effective T cell priming; in mice 100–10,000 times the parental wild-type (WT) strain inoculum doses (108–109 avirulent bacteria) are needed to achieve comparable immunity (9, 10). Further, use of replication-deficient Lm strains often requires prime-boost regimens for stimulation of the desired response (9). An alternative approach to enhance patient safety is to limit bacterial replication following vaccination by antibiotic treatment. Although this strategy clearly limits the infection, some studies suggest that the magnitude and long-term effector function of the cells stimulated may be impaired, which ultimately compromises vaccine efficacy (11, 12). In this study, we have investigated whether the magnitude of the Ag-specific CD8 T cell response can be amplified following immunization with a strain of Lm that hyper secretes a target Ag of interest. We find that over a wide range of immunization doses, the magnitude of the target-Ag specific CD8 T cell response is markedly increased following inoculation with the hypersecreting Lm strain relative to that achieved by immunization with a WT control strain. Our studies further show that effector functions and memory development are enhanced following immunization with the hyperantigen secreting strain compared with WT Lm. Although antibiotic treatment following Lm immunization impairs priming of CD8 T cells to Ag secreted at WT levels, antibiotic treatment does not influence the CD8 T cell response to a target Ag when secreted at an enhanced level. These results support the continued interest in Lm as a vaccine delivery platform and suggest that safety can be improved without loss of efficacy by a strategy using reduced doses of a hyperantigen secreting strain of Lm in conjunction with antibiotic treatment to limit the infection. The 6–8-wk-old BALB/c mice were purchased from The Jackson Laboratory. Mice were systemically infected by i.v. injection in the lateral tail vein with 100–260 CFU (“low dose”), 400–600 CFU (“mid-dose”), or 700-1000 CFU (“high dose”) of various Lm strains in a volume of 200 μl. All experiments with animals were conducted with approval from the VA Institutional Animal Care and Use Committee. Lm strains 10403 (“wild type”; originally obtained from Dr. E. Hall, Washington State University), 43251 (“hyper listeriolysin O (LLO)”; American Type Culture Collection), and ANT-4 (“hyperLLO/p60”; provided by Dr. E. Pamer, Memorial Sloan-Kettering Cancer Center) were used to evaluate the influence of increased target Ag secretion on the magnitude of CD8 T cell responses. J774 cells (TIB67; ATCC) were maintained in DMEM containing 10% FCS and 5 μg/ml gentamicin (Invitrogen Life Technologies). L2 murine fibroblasts (a gift from Dr. D. Portnoy, University of California-Berkeley) were grown in DMEM containing 10% FCS plus 2 mM glutamine. RMAS-Kd cells (provided by Dr. M. Bevan, University of Washington) were maintained in RPMI 1640 containing 10% FCS and 200 μg/ml G418 (Invitrogen Life Technologies). Synthetic peptides for LLO91–99 (GYKDGNEYI) and p60217–225 (KYGVSVQDI) were produced at the VA Medical Center using an Applied Biosystems Synergy apparatus and standard Fmoc chemistry. Lm strains were grown 16 h in brain heart infusion broth. One milliliter of culture was added to 9 ml of brain heart infusion and grown for 5 h at 37°C with agitation. A 1 ml aliquot was removed and hemolytic activity of culture supernatants determined as described (13) with slight modifications. Briefly, following incubation of culture supernatants with sheep RBC, samples were centrifuged (13,000 × g) for 1 min. A total of 100 μl of the supernatant was transferred to a 96-well flat-bottom microtiter plate (Nalge Nunc International) and the absorbance at 541 nm for each well was measured in a VERSAmax microplate reader using SoftMax Pro v1.2 software (Molecular Devices). Hemolytic units were defined as the reciprocal of the dilution of culture supernatant that yielded 50% lysis of sheep RBC. The remaining volume of culture was centrifuged (6000 × g) for 10 min at 4°C and supernatants were precipitated for 1 h on ice in the presence of 10% trichloroacetic acid (v/v). Samples were centrifuged (6000 × g) for 10 min at 4°C and equivalent amounts of each sample were resuspended in protein sample buffer and analyzed by SDS-PAGE followed by Coomassie staining. Plaque assays were performed to determine the bacterial spread from cell to cell by infecting confluent 100 mm dishes of murine L2 fibroblasts cells with 20 ml of 1/250 diluted bacterial cultures grown overnight at 30°C in BHI broth without shaking (14). To measure intracellular bacterial growth in vitro, monolayers of J774 cells were infected with either WT or hyperLLO Lm at a multiplicity of infection of 2–5. After 1 h, the monolayers were washed twice with prewarmed PBS, and then DMEM containing 10% FCS and 40 μg/ml gentamicin was added to kill remaining extracellular bacteria. At indicated time points postinfection, J774 cells were lysed and intracellular bacteria enumerated by plating on BHI agar. To evaluate in vivo growth, naive BALB/c mice were i.v. infected with 200 or 1000 CFU of WT or hyperLLO Lm. At various time points postinfection, spleens were homogenized and serial dilutions plated onto BHI agar to enumerate the bacterial load. Spleens were removed and single-cell suspensions prepared by passing the tissue over a cell strainer. Intracellular cytokine staining was performed by culturing splenocytes ex vivo for 5 h with 10−6 M peptide in the presence of Brefeldin A (BioLegend). Surface staining for CD3 and CD8 and intracellular staining for IFN-γ was performed with the Cytofix/Cytoperm kit according to the manufacturer’s directions (BD Biosciences). Cells were stained with FITC, PE, PerCP, Pacific Blue, and/or allophycocyanin-conjugated Abs specific for CD8α (clone 53–6.7; eBioscience), CD3 (clone 145–2C11, eBioscience), and IFN-γ (clone XMG1.2; eBioscience). Data acquisition was performed on a BD LSR II flow cytometer and was analyzed using FlowJo software (Tree Star). Sixteen to 18 h before use, 96-well nitrocellulose plates (Millipore) were coated overnight at 4°C with capture α-IFN-γ Ab (Mouse IFN-γ ELISPOT pair; BD Biosciences). Before use, plates were washed three times with sterile PBS and then blocked for 1 h with RPMI 1640 and 10% FCS. RMAS-Kd cells were held overnight at room temperature, washed, resuspended at 1 × 106 cells/ml in RPMI 1640 and 10% FCS, pulsed with 10−7 M peptide for 2 h, and then washed 2 times. A total of 105 peptide-pulsed RMAS cells and 0.5–1 × 105 splenocytes from Lm-infected mice were added to wells in a total volume of 200 μl in RPMI 1640 plus 10% FCS, 5 × 10−5 M 2-ME, 100 U/ml penicillin, 100 μg/ml streptomycin, and 30 U/ml rhIL-2 (Tecin, Biological Response Modifier Program) and cultured for 24 h at 37°C and 7.5% CO2. All wells were set up in triplicate. Plates were developed according to the manufacturer’s protocol, and spots were visualized using BCIP/NBT substrate (Kirkegaard & Perry Laboratories). The number of spots per well was evaluated with an AID High-Resolution ELISPOT reader system and software (Autoimmun Diagnostika). The number of spots present in wells containing nonpeptide-pulsed RMAS-Kd cells plus immune splenocytes was used to determine background staining and this value was subtracted from all results (typically <5 spots). The relative TCR avidity of LLO91–99-specific CD8 T cell populations was determined by performing intracellular cytokine staining on splenocytes stimulated for 5 h ex vivo with a gradient of 1000–0.04 ng/ml LLO91–99 peptide in the presence of Brefeldin A. For individual animals, the frequency of IFN-γ-producing CD8 T cells in response to each peptide concentration was determined then standardized, setting the largest response for each animal to 100%. The avidity of the peptide-specific response was determined to be the concentration of peptide required to stimulate 50% of the potentially responsive CD8 T cells from each individual animal (15). The analysis of in vivo clearance of peptide-loaded target cells was performed as described (16, 17). Naive BALB/c splenocytes were labeled with Vybrant DiI (Invitrogen Life Technologies) and either 1 μM, 100 nM, or 1 nM CFSE (Invitrogen Life Technologies). Target cell populations of different CFSE staining intensity were subsequently pulsed for 1 h at room temperature with 1 μM LLO91–99, p60217–225, or no peptide. A pooled suspension containing 5 × 106 of each target cell population was injected i.v. into recipient mice in 200 μl PBS. Animals were rested 6 or 18 h before recipient spleens were analyzed by flow cytometry for target cell clearance. Gating on Vybrant DiI+ cells (all target cells), the percent killing was calculated as: 100% − ([(% peptide pulsed in immune/% unpulsed in immune)/(% peptide pulsed in naive/% unpulsed in naive)] × 100). To evaluate antilisterial protection in immunized mice following Lm challenge, the bacterial burden in the spleen was determined by ex vivo CFU clearance assays (18). Spleens were harvested into sterile PBS and weighed. Tissues were homogenized mechanically using a Polytron electric homogenizer (KINEMATICA). Serial dilutions were made in sterile PBS and plated onto BHI agar. Plates were incubated overnight at 37° C. The log10 CFU/g of tissue was calculated as: log10 [(CFU/dilution factor) × ((organ weight plus homogenate volume)/organ weight)]. Beginning 24 h following Lm immunization, mice were treated with 2 mg ampicillin by i.p. injection, 2× daily, for three consecutive days. Data are expressed as the mean ± SD, and a representative experiment is shown for each figure. Statistical probabilities were evaluated by Student’s t test, one-way ANOVA with Tukey’s multiple comparison posttest, or two-way ANOVA with Bonferroni’s posttest where appropriate. Probability values of p < 0.05 were considered to be significant. The following notations have been used to denote p values in all figures: ∗, p < 0.05; ∗∗, p < 0.01; ∗∗∗, p < 0.001. One approach that has been attempted to enhance peptide-specific responses following immunization with Lm is the use of large doses of virulence-attenuated strains. We were interested in exploring an alternative immunization strategy, using as the immunogen a lower dose of a virulent strain of Lm that secretes enhanced levels of the target Ag of interest. For these studies, we used a strain of Lm that hyper secretes the endogenous LLO protein (hyperLLO Lm strain 43251). This is a prfA∗ strain, which results in the enhanced production of only PrfA-regulated proteins such as LLO (unpublished observation). PAGE analyses of TCA precipitates of Lm culture supernatants confirmed that the hyperLLO Lm strain secretes ∼100× more LLO protein than WT Lm, correlating with an 8.5-fold increase in hemolytic activity (Fig. 1⇓A). HyperLLO Lm showed a reduced ability to spread from cell to cell relative to WT Lm, as determined by in vitro plaque assays (Fig. 1⇓B). However, these variations did not impact the virulence of the hyperLLO Lm strain, as its’ LD50 was similar to that of WT Lm; ∼5–10 × 103 CFU (data not shown). Virulence phenotype of hyperLLO secreting strain of L. monocytogenes. A, HyperLLO secreting Lm (↑LLO) was evaluated for LLO production via TCA precipitates of culture supernatants. Relative to WT Lm (WT), ↑LLO Lm produces ∼100× more LLO, resulting in a 8.5-fold increase in hemolytic units (HU). B, In vitro plaque assays revealed that ↑LLO Lm shows a 50% reduction in cell-cell spread. C, Monolayers of J774 cells were infected with either WT or ↑LLO Lm at multiplicity of infection of 2–5. At indicated time points postinfection, cells were lysed and intracellular bacteria enumerated by plating on BHI agar. D, To evaluate in vivo growth, naive BALB/c mice were infected i.v. with either 1000 CFU of WT Lm or 1000 or 200 CFU of ↑LLO Lm. At indicated time points postinfection, spleens were homogenized and plated onto BHI agar to enumerate the bacterial load. Indicated p values denote statistical significance between the 1000 and 200 CFU ↑LLO Lm groups: ∗, p < 0.05; ∗∗∗, p < 0.001. LOD = limit of detection. Experiments were performed three times with 3–4 mice/group/time point. The intracellular growth properties of the hyperLLO Lm strain were also comparable to those of WT Lm. Following in vitro infection of a macrophage cell line (J774 cells), the growth kinetics of hyperLLO Lm were similar to those of WT Lm (Fig. 1⇑C). The kinetics of bacterial replication and clearance in vivo were also comparable. Injection of mice with 1000 CFU of either WT or hyperLLO Lm showed similar growth curve properties; log phase growth for 2–3 days followed by a reduction of bacteria over the next 4 days (Fig. 1⇑D). A reduced injection dose of 200 CFU of hyperLLO Lm also showed comparable growth kinetics, yet the overall bacterial load never reached the level seen following immunization with 1000 CFU of either WT or hyperLLO Lm. These similarities of in vivo growth and virulence between WT and hyperLLO Lm allowed us to specifically investigate how variations in the amount of Ag secreted by Lm influence the magnitude and effector function of Ag-specific CD8 T cell responses at equivalent infection doses. 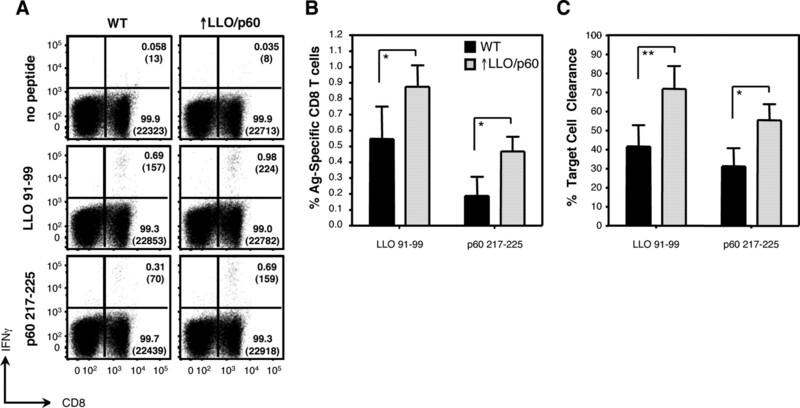 Using these Lm strains with a 100-fold difference in LLO protein secretion but equivalent virulence, we determined whether enhanced secretion of the LLO target Ag influenced the LLO91–99-specific CD8 T cell response that develops following immunization. Naive BALB/c mice were immunized with a high dose (800 CFU), a mid-level dose (500 CFU), or a low dose (200 CFU) of either WT or hyperLLO Lm. On day 7 following vaccination, the frequency (Fig. 2⇓, A and B) and total number (Fig. 2⇓C) of LLO91–99- and p60217–225-specific cells were determined by intracellular cytokine staining (ICS). At the higher immunization dose, the frequency of LLO91–99-specific CD8 T cells was slightly, but not significantly, enhanced in the hyperLLO-immunized mice relative to those receiving WT Lm (Fig. 2⇓, A and B). In contrast, following immunization with the mid- or low-level vaccination doses, the LLO91–99-specific CD8 T cell response was significantly enhanced in the hyperLLO-injected group relative to the response seen in the WT Lm-immunized groups (Fig. 2⇓, A–C). 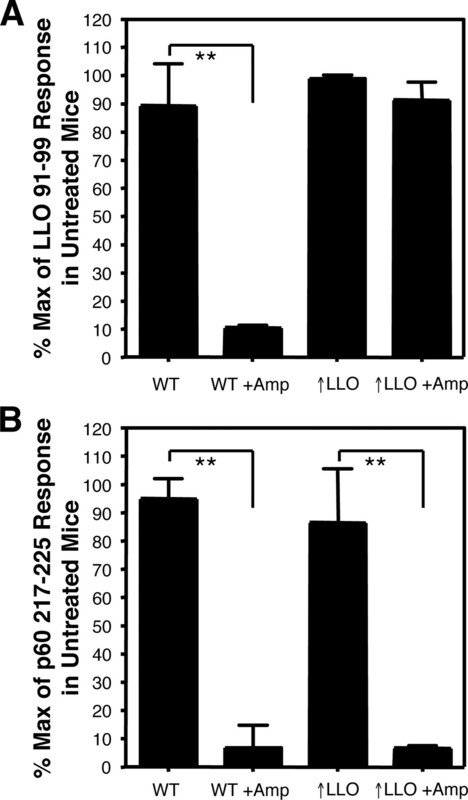 This enhanced LLO response was specific for the hypersecreted LLO Ag and not a global effect of enhanced LLO production increasing all Ag-specific responses; CD8 T cells specific for the p60217–225-Lm determinant were not influenced by hyperLLO secretion and remained at the level seen following immunization with WT Lm (Fig. 2⇓, A–C). When the magnitude of the LLO91–99-specific response was determined following vaccination with a broad range of immunization doses, a clearer effect of hyperLLO secretion became apparent; frequencies of >1% LLO-specific CD8 T cells were rarely achieved following immunization with any dose of WT Lm, whereas frequencies of >1% LLO91–99-specific cells were consistently achieved following immunization with as few as 400 CFU of hyperLLO Lm (Fig. 2⇓D). The p60217–225-specific response was consistently below 0.5% at all doses of either Lm strain. As differences in the magnitude of the LLO91–99-specific CD8 T cell response are clearly apparent following immunization with mid-level doses, additional experiments were performed to compare the functional properties of cells stimulated by vaccination with mid-level doses of either Lm strain. Immunization with hyperLLO secreting Lm increases the magnitude of LLO-specific CD8 T cell responses. A, Seven days following immunization with high (800 CFU), mid-level (500 CFU), or low (200 CFU) doses WT or hyperLLO secreting Lm (↑LLO), the frequency of LLO91–99-specific CD8 T cells in the spleen was determined by ICS. The upper numbers in the FACS plots represent the frequency of IFN-γ+ and IFN-γ− cells within the CD3+CD8+ subset, while the number in parentheses indicates the total number of events within that quadrant. Representative FACS plot are provided in A, while the means and SDs of the frequency (B) and total number (C) of Ag-specific cells in the spleen from one experiment is shown. The frequency of IFN-γ-producing CD8 T cells specific for either LLO91–99 (D) or p60217–225 (E) was determined by ICS 7 days following immunization with a broad range of doses of WT (left panels) or ↑LLO (right panels) Lm. Dots represent individual animals and the gray shaded area indicates mid-level vaccine doses, with responses to low dose immunization to the left and high dose responses to the right. ∗, p < 0.05; ∗∗, p < 0.01. Experiments were performed a minimum of three times with 2–4 mice/group/time point. In some settings, increasing Ag levels results in the activation of T cells with lower affinity, thus decreasing the collective avidity of the determinant-specific effector cell population (19, 20). To address whether immunization with the hyperLLO Lm strain influenced the avidity of the resulting LLO91–99-specific CD8 effector T cells, splenocytes from mice immunized 7 days previously with a mid-level dose (400 CFU) of either WT or hyperLLO Lm were stimulated ex vivo with a gradient of 1000–0.04 ng/ml LLO91–99 peptide. For individual animals, the frequency of IFN-γ-producing effector cells for each peptide concentration was determined by ICS then normalized, setting the maximum response for each animal to 100%. The avidity of the peptide-specific response was determined to be the concentration of peptide required to stimulate 50% of the potentially responsive CD8 T cells from each individual animal (15). As indicated in Fig. 3⇓A, the avidity of the LLO91–99-specific CD8 T cells from WT and hyperLLO Lm immunized animals were identical, with both effector populations showing 50% of their maximum response at a concentration between 0.12 and 0.37 ng/ml LLO91–99 peptide. Vaccination with hyperLLO secreting Lm enhances the magnitude of the peak memory and recall responses without influencing avidity. A, The avidity of the LLO91–99-specific population was measured 7 days after immunization with 400 CFU WT or ↑LLO Lm by ICS analysis with a decreasing concentration of LLO91–99 peptide. 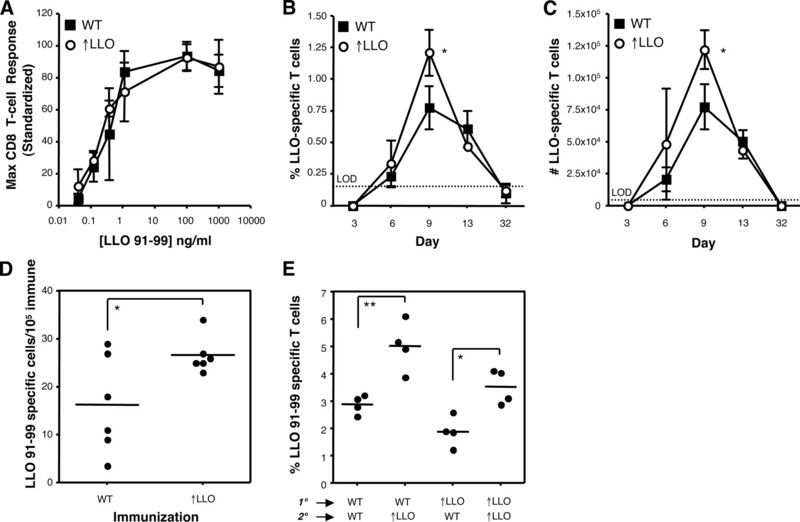 B and C, The kinetics of the primary LLO91–99 response was determined by ICS in mice immunized with 400 CFU of WT or ↑LLO Lm at several time points postimmunization. D, Twenty-eight days following immunization with 100 CFU of WT or ↑LLO Lm, the frequency of the LLO91–99-specific response was determined by IFN-γ ELISPOT. E, Mice were immunized with 400 CFU of WT or ↑LLO then, 28 days later, a subset from each group received a boost immunization (4000 CFU) with either WT or ↑LLO as indicated. On day 7 following boost, spleen cells were assessed for the frequency of LLO91–99-specific cells by ICS. ∗, p < 0.05; ∗∗, p < 0.01. Experiments were performed three times with 3–6 mice/group/time point. The previous analyses were performed at one time point (day 7 postimmunization), presumed to be the peak of the primary response based on the published CD8 response kinetics following WT Lm immunization (21). 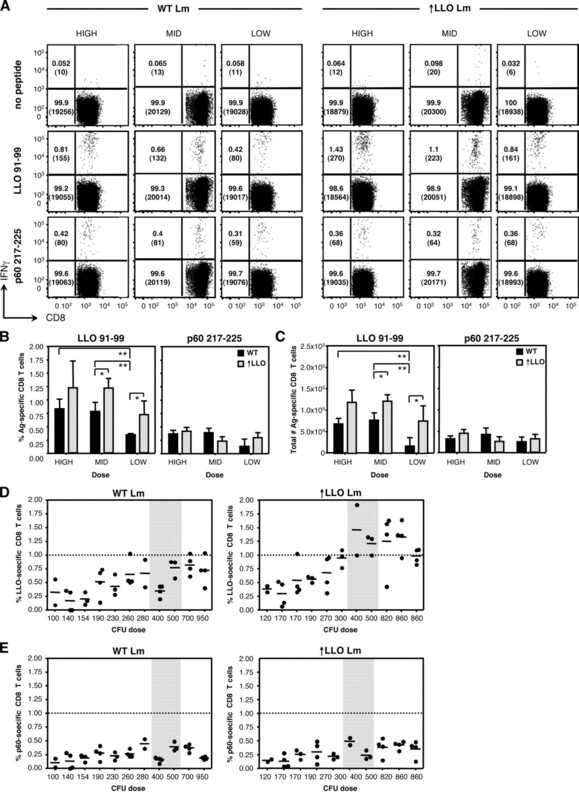 To confirm that the enhanced LLO91–99-specific CD8 T cell response seen in mice immunized with hyperLLO Lm did not simply reflect an alteration in the kinetics of T cell expansion and contraction, mice were immunized with a mid-level dose (400 CFU) of either strain, and the frequency and absolute number of LLO91–99-specific CD8 T cells was evaluated throughout the expansion and contraction phases (Fig. 3⇑, B and C). These data indicate that the kinetics of the LLO91–99-specific response stimulated by either WT or hyperLLO Lm are comparable, and that a difference in the kinetic parameters of the Ag-specific response cannot account for the enhanced frequency of LLO91–99-specific cells seen following immunization with hyperLLO Lm. The sensitivity of intracellular cytokine staining does not allow for an accurate measurement of the size of the LLO91–99-specific resting memory population, as these cells contract to a level below the limits of detection for that assay (Fig. 3⇑, B and C, day 32). To more closely evaluate whether the enhanced LLO91–99-specific CD8 T cell response stimulated by immunization with low doses of hyperLLO Lm resulted in an enhanced memory population, ELISPOT analysis was performed 4 wk following immunization with a low dose (100 CFU) of either WT or hyperLLO Lm. These experiments indicated that enhancements in the LLO91–99-specific CD8 T cell population were maintained throughout the contraction phase of the response, with a greater frequency of LLO91–99-specific CD8 T cells surviving contraction following hyperLLO Lm immunization (Fig. 3⇑D). To determine whether a similar enhancement in LLO91–99-specific cells could be achieved by a secondary boost vaccination with the hyperLLO Lm strain, BALB/c mice were immunized with a mid-level dose of 400 CFU of WT or hyperLLO Lm. Twenty-eight days later, animals from each group were boosted with 4000 CFU of either WT or hyperLLO Lm as indicated. The secondary expansion of Ag-specific cells was determined by intracellular cytokine staining 7 days following the boost (Fig. 3⇑E). When the secondary response was evaluated, the enhanced LLO91–99-specific response seen following hyperLLO Lm immunization was still evident. Regardless of whether mice were primed with WT or hyperLLO Lm, the magnitude of the secondary response was always greater following boost with hyperLLO Lm than in response to WT Lm boost. Collectively, these experiments suggest that enhanced target Ag production by Lm can improve the stimulation of CD8 T cell populations. This enhanced magnitude of the LLO91–99-specific CD8 T cell response is particularly evident following mid to low immunization doses with the hyperLLO secreting Lm strain and is maintained throughout contraction into the memory phase. Further, boosting with the hyperantigen-secreting Lm strain improves the magnitude of secondary responses, regardless of whether the primary response was induced with the WT or hyperLLO strain. The previous results show that the magnitude of the LLO91–99-specific CD8 T cell response can be enhanced following immunization with a strain of Lm that hyper secretes the LLO protein. It remained to be determined whether the increased effector cell frequency would translate into increased effector function, as measured by in vivo CTL function or antilisterial protection. On day 7 following immunization with a high or low dose (1000 or 200 CFU) of either WT or hyperLLO Lm, the ability to clear fluorescently labeled peptide-pulsed target cells as a measure of in vivo CTL function was determined (Fig. 4⇓A). Following high dose immunization, we observed enhanced clearance of Ag-coated targets in mice immunized 7 days previously with hyperLLO Lm relative to the response see in WT-immunized animals. At the low immunization dose, target cell clearance remained high in animals injected with the hyperLLO-secreting strain, while there was a marked reduction of in vivo target cell clearance in animals immunized with low dose WT Lm. These data support the hypothesis that immunization with hyperLLO Lm enhances both the magnitude and effector function of the LLO target-Ag specific CD8 T cell population. Immunization with hyperLLO secreting Lm enhances cytolytic CD8 T cell effector function. BALB/c mice were injected with either 1000 or 200 CFU of WT or hyperLLO Lm (↑LLO), and the ability to clear LLO91–99-pulsed target cells in vivo was evaluated by a 6-h cytotoxicity assay 7 days later (A) and an 18-h cytotoxicity assay 28 days following immunization (B). C, To evaluate protection from Lm challenge, mice were immunized with 200 or 1000 CFU of WT or ↑LLO Lm, rested 3 wk, then challenged with five LD50 of WT Lm. Two days later, the remaining bacterial burden in the spleen was compared with that of naive challenge recipients. ∗, p < 0.05; ∗∗, p < 0.01; ∗∗∗, p < 0.001. Experiments were performed four times with 3–5 mice/group. To evaluate the maintenance of Ag-specific CD8 memory CTL function, animals were rested for 4 wk following vaccination with WT or hyperLLO Lm before in vivo target cell clearance was performed. Mice immunized 4 wk previously with a high dose (1000 CFU) of WT Lm efficiently cleared peptide-coated targets, whereas following low dose WT Lm (200 CFU), significantly less in vivo cytolytic activity was evident (Fig. 4⇑B). In marked contrast, mice immunized with either the high or low dose of the hyperLLO strain of Lm maintained significant target cell clearance 4 wk postvaccination. These data indicate that immunization with a low dose of the hyperantigen-secreting Lm stimulates Ag-specific CD8 T cells with long-lived effector function. To assess antilisterial protection following immunization with high or low doses of WT and hyperLLO Lm, mice were immunized and then rested for 4 wk. Mice were then challenged with five LD50 of WT Lm, and the ability to clear the bacteria from the spleen was determined by CFU clearance assay (Fig. 4⇑C). Mice immunized with the high dose of either WT or hyperLLO Lm showed significant protection against the challenge infection, reducing the bacterial load by ∼3 logs relative to naive mice. However, animals immunized with the low dose of WT Lm (200 CFU) did not show significant clearance of the challenge dose. In contrast, mice immunized with the low dose of hyperLLO Lm significantly reduced the bacterial load. Taken together, these findings indicate that immunization with a low dose of hyperLLO Lm results in the enhanced development of Ag-specific CD8 T cells with cytolytic function. This enhanced CTL activity is evident early after immunization (Fig. 4⇑A), is maintained throughout contraction into the memory phase (Fig. 4⇑B), and confers a greater level of protection against challenge infection (Fig. 4⇑C). It is possible that the increased magnitude of the LLO response observed following immunization with the hyperLLO strain is unique to LLO as the target Ag. To determine whether an enhanced response occurs following immunization with a strain of Lm that is a hyper secretor for a distinct target Ag, mice were immunized with the ANT-4 strain of Lm, which is a hyper secretor for the p60 molecule (22). The ANT-4 strain secretes ∼70% more p60 than the parent strain, which is Lm 43251 (hyperLLO), thus this strain is both a hyperLLO and hyperp60 secretor. Not surprising, in vitro and in vivo virulence for the ANT-4 strain (hereafter referred to as hyperLLO/p60) is identical with WT Lm (data not shown), thus it is possible to evaluate the development of an effector response where the differences in Ag secretion (not virulence) is the variable. Immunization with hyperLLO/p60 Lm results in an enhanced frequency of both LLO91–99- and p60217–225-specific CD8 T cells (Fig. 5⇓, A and B) compared with that seen following immunization with WT Lm. On day 7 following immunization with a low dose (200 CFU) of either WT or hyperLLO/p60 Lm, the ability to clear fluorescently labeled peptide-pulsed target cells as a measure of in vivo CTL function was determined (Fig. 5⇓C). Confirming our results shown in Fig. 4⇑, we found that immunization with hyperLLO/p60 Lm resulted in enhanced clearance of both LLO and p60-coated targets relative to responses seen in mice immunized with WT Lm. These results indicate that stimulation of an enhanced response is not limited to the LLO molecule following immunization with a hyperantigen secreting strain of Lm. Enhanced p60 secretion improves the magnitude of p60-specific CD8 T cell responses. BALB/c mice were immunized with 400 CFU of WT or hyperLLO/p60 Lm (↑LLO/p60), then evaluated 7 days later for the frequency of LLO91–99- and p60217–225-specific CD8 T cells in the spleen by ICS. Representative FACS plots are shown in A where the upper numbers in the FACS plots represent the frequency of IFN-γ+ and IFN-γ− cells within the CD3+CD8+ subset, while the number in parentheses indicates the total number of events within that quadrant. B, The mean and SD of each immunization group in A are indicated. C, BALB/c mice received 200 CFU of WT or ↑LLO/p60 Lm, and the ability to clear LLO91–99- and p60217–225-pulsed target cells in vivo was evaluated by a 6-h cytotoxicity assay 7 days following immunization. ∗, p < 0.05; ∗∗, p < 0.01. Experiments were performed three times with 4 mice/group. As a vaccine vector candidate, Lm is promising due to its’ sensitivity to antibiotic treatment. Thus following vaccination, antibiotic therapy could be introduced to limit the extent of the infection. However, the timing between Lm vaccination and the onset of antibiotic treatment can severely limit the magnitude of the T cell response that develops (11), presumably by truncating the infection before an antigenic threshold, cytokine milieu, and/or an appropriate inflammatory environment can be reached. To determine whether hyperantigen secretion by Lm might circumvent this dampening effect of antibiotic treatment on the magnitude of the response, we evaluated whether antibiotic treatment would have an effect on CD8 T cell priming following low dose Lm vaccination. Animals were immunized with a low dose of 100 CFU of WT or hyperLLO Lm, and then a subset underwent antibiotic treatment initiated at 24 h postvaccination. Seven days following immunization, the frequency of LLO91–99-specific CD8 T cells was determined by ELISPOT analysis and responses were standardized with the max response set as that achieved following immunization with either strain in the absence of antibiotic treatment. Following immunization with WT Lm, antibiotic treatment almost completely abolished priming of both LLO91–99-specific CD8 T cells (Fig. 6⇓A) as well as cells specific for the subdominant p60217–225 determinant (Fig. 6⇓B). In contrast, when mice were vaccinated with a low dose (100 CFU) of the hyperLLO Lm strain, antibiotic treatment had no effect on the magnitude of the response specific for the LLO91–99 target Ag (Fig. 6⇓A). Antibiotic treatment eliminated priming of cells specific for the p60217–225 determinant (Fig. 6⇓B), which is produced at WT levels by the hyperLLO Lm. These results establish that priming of effector responses to the hyper secreted target Ag is not altered by antibiotic treatment to limit the extent of the infection and, furthermore, demonstrate the independent nature of peptide-specific effector cell development following immunization with Lm. Antibiotic treatment does not impair LLO91–99-specific CD8 T cell responses following vaccination with hyperLLO Lm. BALB/c mice were immunized with 100 CFU of WT or hyperLLO Lm (↑LLO). At 24 h postvaccination, a subset of mice in each group began treatment with 2 mg of ampicillin delivered i.p., 2× daily, for 3 days. On day 7 following immunization, animals were evaluated for the frequency of LLO91–99- (A) and p60217–225-specific (B) CD8 T cells by IFN-γ ELISPOT, and responses for each strain were normalized against the maximum response seen in untreated mice. ∗∗, p < 0.01. Experiments were performed four times with 4 mice/group. Strategies to enhance and maximize the level of effector cell function and specific immunity following immunization are central for the development of effective vaccine candidates. The experiments described in this study were designed to assess whether an increased level of target Ag secretion by an intracytosolic bacterial vector influenced the absolute magnitude and functionality of the subsequent immune response. Our results show that immunization with hyperantigen secreting strains of Lm stimulate an increased absolute magnitude of the target-Ag specific CD8 T cell population compared with the response observed following immunization with a strain secreting WT levels of the target Ag, and this enhanced response remains evident following antibiotic therapy to limit the infection. This enhanced response is most evident at lower immunization doses, with the elevated CD8 T cell levels maintained into the memory phase. Furthermore, following immunization with the lower dose of a hyper secreting Lm strain, the enhanced Ag-specific CD8 T cell population confers protection against lethal bacterial challenge. Previous attempts to enhance responses stimulated by Lm vaccination have focused on increased immunization doses as a means to deliver a higher level of Ag to the immune response of the host. Using WT Lm, this approach has been limited by the virulence of the bacteria (LD50 of 2–5 × 104 for BALB/c and 1–2 × 105 for C57BL/6 mice), such that a further increase to the vaccine dose is not feasible. Doses of 1,000–20,000 CFU of WT Lm have been used as a surrogate mechanism to increase the Ag load in the system (11), although it is not clear whether such an approach increases the density of Ag per APC or whether the overall Ag load is increased because of the presence of greater bacterial numbers, with the latter the most likely possibility. This study reported no enhancement in the magnitude of the LLO91–99-specific CD8 T cell population following immunization with increasing Lm inoculum doses, a finding that may reflect the efficiency of fully virulent Lm in stimulating CD8 T cells, such that the lowest dose evaluated (1000 CFU) may have recruited all potentially responsive CTL precursors and stimulated the maximum magnitude possible. In contrast, we were able to achieve comparable CD8 T cell responses, as seen following WT Lm immunization, with reduced doses of hyper Ag-secreting Lm strains. As an alternative to overcome the LD50 limitations associated with the use of WT Lm, virulence-attenuated Lm strains have been used to evaluate immune responses to higher inoculum doses. However, there are different issues to be considered in the interpretation of results generated using attenuated Lm strains, as these bacteria are essentially cleared from the host without undergoing log phase growth and, thus, may not accurately reflect what occurs from a true infection (10, 22). For example, it is likely that the inflammatory milieu at the site of Ag processing and presentation (spleen) following immunization with the typical virulent WT Lm strain (which replicates two orders of magnitude in the first 2–3 days) is quite different from that found following immunization with an attenuated strain of Lm that does not possess a readily demonstrable growth phase. Additionally, it has been reported that Lm can grow extracellularly in the gall bladder of infected mice as well as be sequestered in the bile duct, resulting in a depot of bacteria that may re-emerge at later time points (23, 24). In light of this, strategies relying on increased numbers of Lm vaccine vectors to enhance Ag-specific immune responses may not be the most tenable strategy for eventual use in any given patient population. Viral vectors designed to increase the level of Ag available for endogenous processing have been found to increase the frequency of responding CD8 effector T cells (25, 26). In support of this, vaccination of mice with dendritic cells bearing increasing epitope density yields an enhanced frequency of effector CD8 T cells (27). An evaluation of epitope density produced by recombinant vaccinia virus, varying from 300 to 60,000 copies per cell, indicated that the magnitude of primary CD8 T cell effector populations is proportional to the epitope density until excessively high levels of Ag are reached (25). At the highest levels of Ag density, the Ag-specific CD8 population appears to be functionally compromised (26). It is apparent from these types of studies that a threshold level of Ag is a key factor for determining the subsequent response level. In a conceptually similar study, the antigenic threshold required for stimulation of Ag-specific CD8 T cell populations was evaluated in the Lm model using infection with constructs engineered to alter target-Ag processing efficiencies due to amino acid substitution in a flanking residue of the p60217–225 target peptide (28). For this report, a “maximum” response was assumed, and the influence of Ag-processing efficiency on this maximum response was the measured outcome. This study demonstrated that activation of peptide-specific CD8 T cells following Lm infection requires a minimum threshold level of Ag; once reached, the magnitude of the Ag-specific CD8 T cell response is not enhanced by increasing the level of Ag display. Our data support these observations and also suggest that immunization with hyperantigen secreting Lm strains may allow such an immunologic antigenic threshold to be reached more quickly following immunization with lower injection doses. Our approach to improve the magnitude of a target-Ag specific CD8 T cell response following Lm immunization focused on a strategy whereby the amount of Ag secreted by the intracytosolic bacteria on a per-cell basis was increased. For these studies, we used as the immunogen a Lm variant that hyper secretes the LLO protein, yet has equal virulence with WT Lm. No significant difference in the magnitude of the response was seen following immunization with the high dose (800 CFU) of either the WT or hyperLLO Lm strain (Fig. 2⇑, A–C), confirming previous work indicating that increased Ag/bacterial immunization doses do not enhance the level of antilisterial immunity (11). However, following mid-level and low dose immunization with hyperantigen secreting Lm, we observed an increased magnitude and effector function in the target-Ag specific CD8 T cell response (equivalent to that stimulated by the higher dose of WT Lm) that was maintained postcontraction into the memory phase and conferred enhanced protection against Lm challenge (Figs. 2–4⇑⇑⇑). In preliminary experiments, we have found that APC infected in vitro with hyperLLO Lm are targeted and killed by CTL much sooner than APC infected with WT Lm (data not shown). In addition, although the bacterial burden is similar at 24 and 48 h postinfection in animals infected with WT or hyperantigen secreting Lm (Fig. 1⇑D), initial ex vivo experiments evaluating Ag display suggest that the number of splenic APC presenting the target Ag is increased in mice immunized with hyperLLO Lm, compared with recipients of WT Lm. Recent reports indicate that T cells specifically integrate TCR-mediated signals and polarize their secretory machinery toward APC with higher Ag densities (29, 30). Although not directly assessed in these studies, vaccine strategies that increase the level of target Ag on the APC surface may provide a better stimulatory signal to naive cells. Whether increased Ag production by Lm lowers the immunization dose required to stimulate protective immunity due to an increased level of Ag per APC or by increasing the number of APC presenting Ag at the host level is under investigation. The capacity to enhance the magnitude of the peptide specific response is not limited to the priming phase, as we also found an enhanced recall response to the LLO91–99 determinant following secondary injection with the hyperLLO secreting strain, regardless of whether the animals were initially immunized with WT or hyperLLO Lm (Fig. 3⇑D). It is worth stressing that the enhanced response stimulated following immunization with hyperantigen secreting Lm strains is specific for the target Ag and not a global effect on Ag presentation. Our data show that immunization with the hyperLLO strain enhances CD8 T cell responses specific for the LLO91–99 determinant, whereas the p60217–225 response is not altered by this immunization strategy (Fig. 2⇑). In contrast, immunization with hyperLLO/p60 Lm results in enhanced magnitudes of both LLO91–99- and p60217–225-specific CD8 T cells, relative to the response stimulated following immunization with WT Lm (Fig. 5⇑). It is possible that increasing the Ag concentration available during T cell priming could recruit CD8 T cell precursors of lower avidity into the developing immune response. The generation and analyses of T cell lines through in vitro restimulation with varying peptide concentrations has found a correlation between lower peptide concentration and higher avidity within the resulting T cell line, suggesting that selection of higher avidity T cells occurs under conditions of limiting Ag in vitro (19, 31). In contrast, immunization of mice with dendritic cells coated with increasing epitope density results in an increase in the primary CD8 T cell response without influencing the avidity of the Ag-specific CD8 T cell population (20). Our analysis of the overall avidity of the primary LLO91–99-specific CD8 T cell population stimulated by immunization with hyperLLO Lm proved comparable to that stimulated by immunization with WT Lm (Fig. 3⇑A) and, thus, in vivo increased levels of target-Ag secretion does not skew the overall response to one of reduced avidity. The use of bacterial vectors for vaccination has several potential advantages, particularly their sensitivity to antibiotic treatment to quickly limit the infection. Following initial stimulation and activation, CD8 T cells undergo a program of dramatic proliferation (32, 33, 34). Antibiotic treatment initiated 24 h after Lm infection has demonstrated that a prolonged period of active infection is not required for efficient CD8 T cell activation (11, 12, 21). However, antibiotic treatment during primary Lm infection has been found to decrease the number of resting memory cells, particularly in the effector memory subset present weeks following infection (12). Early antibiotic treatment following infection with WT Lm may limit the availability of Ag for processing and display on the APC surface, resulting in poor T cell activation. Our data support a model in which vaccination with a hyperantigen secreting Lm strain may reach the required antigenic threshold more quickly, such that treatment with antibiotics no longer interferes with the presentation of the minimum Ag density required for naive CD8 T cell priming. Our results show that when a hyperantigen secreting Lm strain is used for immunization, the Ag-specific effector response is much less influenced by antibiotic treatment (Fig. 6⇑). Thus, the combination of a bacterial vector delivering an increased level of Ag, coupled with antibiotic treatment to quickly truncate the infection, presents an appealing vaccine strategy. When thinking about maximizing the CD8 T cell response following immunization, there is increasing evidence showing that there is a regulatory feature (unknown at present) that may control expanding CD8 T cell populations to prevent the accumulation of “too many” cells of any single specificity, perhaps to prevent immunopathology that can develop following the activation of high numbers of Ag-specific CD8 T cells in vivo (35, 36). Recent evidence indicates that there is a numeric upper limit to the expansion of CD8 T cells of the same specificity, and that increased Ag density or CTL precursor frequency cannot bypass this upper limit (37). In light of this, it may be more important to focus on the development of a sufficient number of CD8 T cells with strong effector function, rather than focusing on absolute numbers per se. This is supported by a recent report indicating that the polyfunctionality of Ag-specific CD8 T cells (i.e., the ability to secrete multiple cytokines and release cytolytic granules) is a better immune correlate for disease progression in HIV patients than the absolute number of Ag-specific cells (38). The findings presented here indicate that immunization with a low dose of hyperantigen secreting Lm is capable of stimulating a functional, protective CD8 memory T cell population. Although the magnitude of this population may not surpass “maximum” magnitude achieved following higher dose immunization with a WT strain or even the hyperantigen secreting strain, these cells display potent effector function and protect against bacterial challenge infection. Further, antibiotic treatment following low-dose vaccination does not impact the magnitude of the CD8 T cell response stimulated following immunization with hyperantigen secreting Lm. These findings support the further evaluation of Lm as a vaccine delivery vehicle for stimulating highly functional CD8 T cell populations for protection and/or therapy against intracellular pathogens and tumors. We thank Dr. David Hinrichs for helpful suggestions and discussions of this work. We additionally thank Augie Pheeney and Ra Hui for their assistance with these studies. ↵1 This work was supported by grant funds from the Veterans Affairs Merit Review program and by National Institutes of Health Grants AI56446, AI44376 (to H.G.A.B. ), AI41816, AI55651 (to N.E.F. ), and AI56446 (to D.E.H.). ↵3 Abbreviations used in this paper: Lm, Listeria monocytogenes; LLO, listeriolysin O; WT, wild type; ICS, intracellular cytokine staining. Shen, H., M. K. Slifka, M. Matloubian, E. R. Jensen, R. Ahmed, J. F. Miller. 1995. Recombinant Listeria monocytogenes as a live vaccine vehicle for the induction of protective anti-viral cell-mediated immunity. Proc. Natl. Acad. Sci. USA 92: 3987-3991. Pan, Z. K., L. M. Weiskirch, Y. Paterson. 1999. Regression of established B16F10 melanoma with a recombinant Listeria monocytogenes vaccine. Cancer Res. 59: 5264-5269. Weiskirch, L. M., Z. K. Pan, Y. Paterson. 2001. The tumor recall response of antitumor immunity primed by a live, recombinant Listeria monocytogenes vaccine comprises multiple effector mechanisms. Clin. Immunol. 98: 346-357. Paterson, Y., P. C. Maciag. 2005. Listeria-based vaccines for cancer treatment. Curr. Opin. Mol. Ther. 7: 454-460. Starks, H., K. W. Bruhn, H. Shen, R. A. Barry, T. W. Dubensky, D. Brockstedt, D. J. Hinrichs, D. E. Higgins, J. F. Miller, M. Giedlin, H. G. Bouwer. 2004. Listeria monocytogenes as a vaccine vector: virulence attenuation or existing antivector immunity does not diminish therapeutic efficacy. J. Immunol. 173: 420-427. Brockstedt, D. G., K. S. Bahjat, M. A. Giedlin, W. Liu, M. Leong, W. Luckett, Y. Gao, P. Schnupf, D. Kapadia, G. Castro, et al 2005. Killed but metabolically active microbes: a new vaccine paradigm for eliciting effector T-cell responses and protective immunity. Nat. Med. 11: 853-860. Bruhn, K. W., N. Craft, B. D. Nguyen, J. Yip, J. F. Miller. 2005. Characterization of anti-self CD8 T-cell responses stimulated by recombinant Listeria monocytogenes expressing the melanoma antigen TRP-2. Vaccine 23: 4263-4272. Stevens, R., A. Lavoy, S. Nordone, M. Burkhard, G. A. Dean. 2005. Pre-existing immunity to pathogenic Listeria monocytogenes does not prevent induction of immune responses to feline immunodeficiency virus by a novel recombinant Listeria monocytogenes vaccine. Vaccine 23: 1479-1490. Bouwer, H. G., C. Alberti-Segui, M. J. Montfort, N. D. Berkowitz, D. E. Higgins. 2006. Directed antigen delivery as a vaccine strategy for an intracellular bacterial pathogen. Proc. Natl. Acad. Sci. USA 103: 5102-5107. Brockstedt, D. G., M. A. Giedlin, M. L. Leong, K. S. Bahjat, Y. Gao, W. Luckett, W. Liu, D. N. Cook, D. A. Portnoy, T. W. Dubensky, Jr. 2004. Listeria-based cancer vaccines that segregate immunogenicity from toxicity. Proc. Natl. Acad. Sci. USA 101: 13832-13837. Mercado, R., S. Vijh, S. E. Allen, K. Kerksiek, I. M. Pilip, E. G. Pamer. 2000. Early programming of T cell populations responding to bacterial infection. J. Immunol. 165: 6833-6839. Portnoy, D. A., P. S. Jacks, D. J. Hinrichs. 1988. Role of hemolysin for the intracellular growth of Listeria monocytogenes. J. Exp. Med. 167: 1459-1471. Sun, A. N., A. Camilli, D. A. Portnoy. 1990. Isolation of Listeria monocytogenes small-plaque mutants defective for intracellular growth and cell-to-cell spread. Infect. Immun. 58: 3770-3778. Byers, A. M., C. C. Kemball, J. M. Moser, A. E. Lukacher. 2003. Cutting edge: rapid in vivo CTL activity by polyoma virus-specific effector and memory CD8+ T cells. J. Immunol. 171: 17-21. Cornell, K. A., H. G. Bouwer, D. J. Hinrichs, R. A. Barry. 1999. Genetic immunization of mice against Listeria monocytogenes using plasmid DNA encoding listeriolysin O. J. Immunol. 163: 322-329. Bullock, T. N., D. W. Mullins, V. H. Engelhard. 2003. Antigen density presented by dendritic cells in vivo differentially affects the number and avidity of primary, memory, and recall CD8+ T cells. J. Immunol. 170: 1822-1829. Badovinac, V. P., B. B. Porter, J. T. Harty. 2002. Programmed contraction of CD8+ T cells after infection. Nat. Immunol. 3: 619-626. Villanueva, M. S., P. Fischer, K. Feen, E. G. Pamer. 1994. Efficiency of MHC class I antigen processing: a quantitative analysis. Immunity 1: 479-489. Hardy, J., K. P. Francis, M. DeBoer, P. Chu, K. Gibbs, C. H. Contag. 2004. Extracellular replication of Listeria monocytogenes in the murine gall bladder. Science 303: 851-853. Hardy, J., J. J. Margolis, C. H. Contag. 2006. Induced biliary excretion of Listeria monocytogenes. Infect. Immun. 74: 1819-1827. Bullock, T. N., T. A. Colella, V. H. Engelhard. 2000. The density of peptides displayed by dendritic cells affects immune responses to human tyrosinase and gp100 in HLA-A2 transgenic mice. J. Immunol. 164: 2354-2361. Vijh, S., I. M. Pilip, E. G. Pamer. 1998. Effect of antigen-processing efficiency on in vivo T cell response magnitudes. J. Immunol. 160: 3971-3977. Huse, M., L. O. Klein, A. T. Girvin, J. M. Faraj, Q. J. Li, M. S. Kuhns, M. M. Davis. 2007. Spatial and temporal dynamics of T cell receptor signaling with a photoactivatable agonist. Immunity 27: 76-88. Bullock, T. N., D. W. Mullins, T. A. Colella, V. H. Engelhard. 2001. Manipulation of avidity to improve effectiveness of adoptively transferred CD8+ T cells for melanoma immunotherapy in human MHC class I-transgenic mice. J. Immunol. 167: 5824-5831. Badovinac, V. P., S. E. Hamilton, J. T. Harty. 2003. Viral infection results in massive CD8+ T cell expansion and mortality in vaccinated perforin-deficient mice. Immunity 18: 463-474. La Gruta, N. L., K. Kedzierska, J. Stambas, P. C. Doherty. 2007. A question of self-preservation: immunopathology in influenza virus infection. Immunol Cell Biol. 85: 85-92. Betts, M. R., M. C. Nason, S. M. West, S. C. De Rosa, S. A. Migueles, J. Abraham, M. M. Lederman, J. M. Benito, P. A. Goepfert, M. Connors, et al 2006. HIV nonprogressors preferentially maintain highly functional HIV-specific CD8+ T cells. Blood 107: 4781-4789.